smiling when you think of all the fun that’s in store! jumping for joy that the Holidays are finally here! Then, this post is just for you! 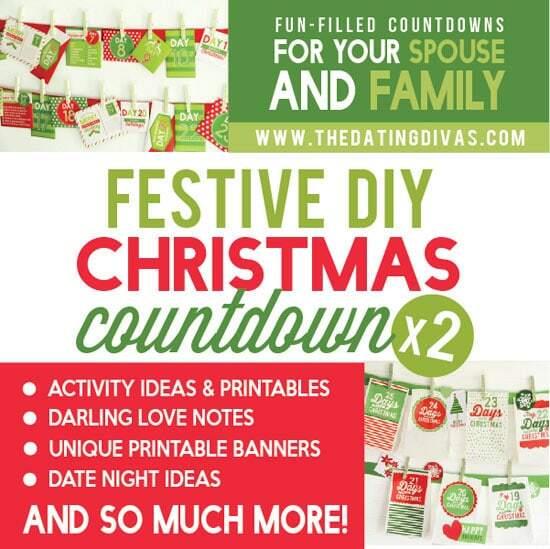 If you want to make the Holidays truly magical this year, create one or both of our DIY Christmas Countdowns. They are both packed with activities and ideas to make this Christmas the most memorable yet! 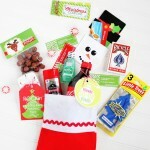 Shower him or her with compliments, acts of service, and a healthy dose of fun Christmas date nights all month long! This countdown calendar to Christmas printable is geared specifically for your significant other and it’s oh-so-fun to add even more magic to an already magical time of year. 25 days of activities to help your family bond over Holiday fun! 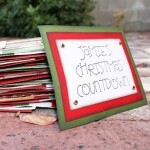 We’ve also provided coordinating printables to make your Christmas countdown truly special for the whole family. 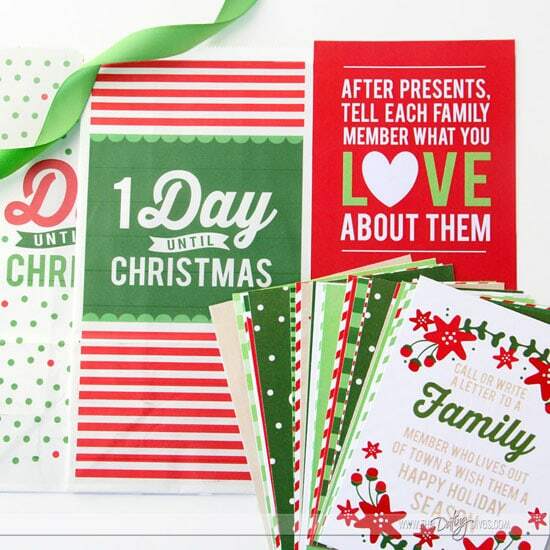 Afterall, making memories is what it’s all about and our Christmas Countdown printable pack will do just that! Remember this post from 4 years ago? Every Christmas season, our readers ask us for a printable version of Tara’s beautiful DIY crafty countdown… This year, we’ve delivered… BIG TIME! Just wait until you see Courtney’s adorable envelopes and activity cards that will make your Christmas calendar shine! Then, cut out each envelope and place adhesive on the flaps. Fold and adhere- easy, peasy! Next, place each card in its coordinating envelope and clip these materials to a gorgeous piece of ribbon. I strung my envelopes on 2 tiers of red ribbon that each measured about 5.5 feet long. We’ve included a handy suggested schedule that sprinkles each type of loving gesture throughout the month of December. But, if you have a Holiday party scheduled on the day we suggest a date night, don’t despair. Our countdown is completely flexible! 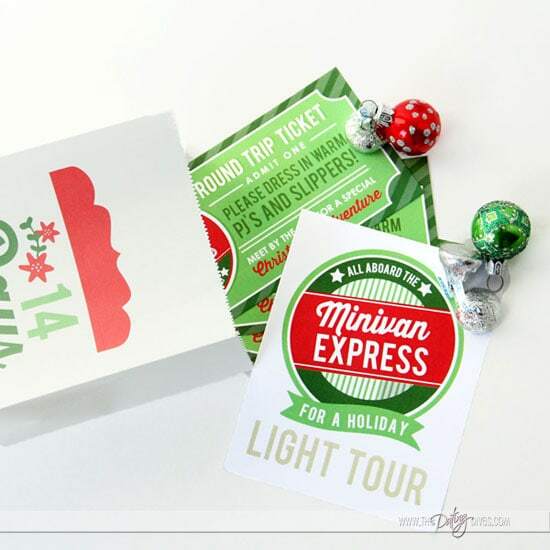 Courtney included blank cards to help you customize your individual Christmas schedule! 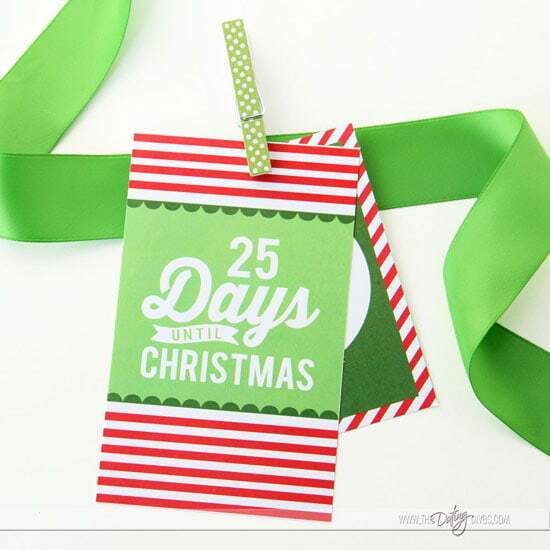 This amazing countdown is packed with 25 activities to create meaningful Holiday memories. We’ve thought of everything you’d need to bond as a family each day leading up to Christmas! By pairing festive green and red graphics with darling activities, we’ve created the perfect modern day advent calendar that the whole family will enjoy! For this DIY Holiday countdown, we’ve included templates for you to print on paper bags. The best news?… Any regular lunch paper bag will work! I chose to print mine on white paper bags that I found at Michael’s craft store to go with my seasonal decor. Since, these “Celebrate It” brand bags are slightly smaller, we included a separate template for you to use so your graphics fit perfectly. 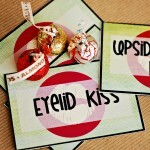 You can’t go wrong with this printable pack! After printing your bags, all you need to do is fill them with a corresponding activity card. Feel free to also include your kiddo’s favorite little treat for an added surprise! This countdown promises family fun, adventure, and treasured memories! For each day until Christmas, we’ve provided either a link or a coordinating printable to help you pull off the suggested activity. When your bags are assembled, attach them with decorative clothespins to a long piece ribbon. 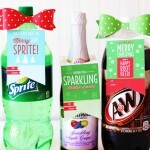 Courtney included several fun embellishments in the pack to make your display even more festive. I also added a few rhinestones to several of the designs for extra sparkle! Don’t want to print on paper bags? No problem! 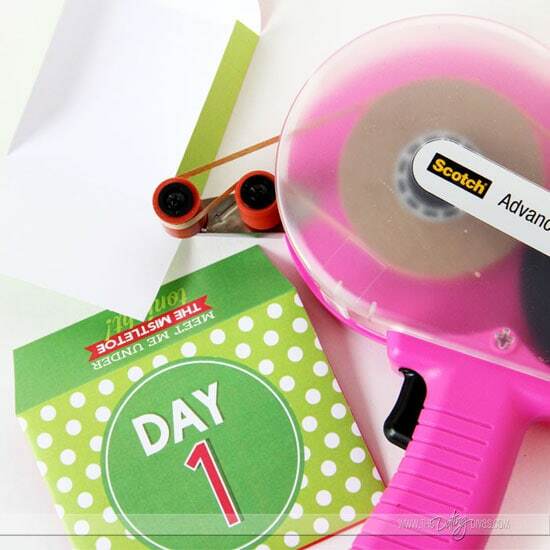 Simply, print and cut out the countdown/activity cards on standard card stock paper. Then, attach the materials to your ribbon pieces using decorative clips! Whether you print on paper bags or not, we guarantee this adorable “Days Until Christmas” countdown will look fabulous in your home. Can you imagine the smile on your child’s face as he or she opens up a bag containing everything you need to host a hot cocoa party? Or what about finding special notes encouraging them to perform small random acts of kindness this season? Counting down the days until Christmas has never been so fun! Our exclusive advent calendar will help you take the focus off of receiving material gifts AND onto spending quality time as a family! 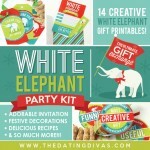 Special Holiday Offer On Our Christmas Countdown Pack! And, just because we love ya, we have a special Holiday offer. You might be in the position, like me, where you want to create BOTH 2014 countdowns– one as a special surprise for your hubby AND one to create awesome memories with your kiddos. That’s why we are bundling them into a Holiday gift package just for you. Here’s your chance to snag 2 darling Christmas calendars that will truly make your Holiday season one to remember! We wish all of our dear readers a BRIGHT and MERRY season that’s filled with love, fun, and a little adventure! 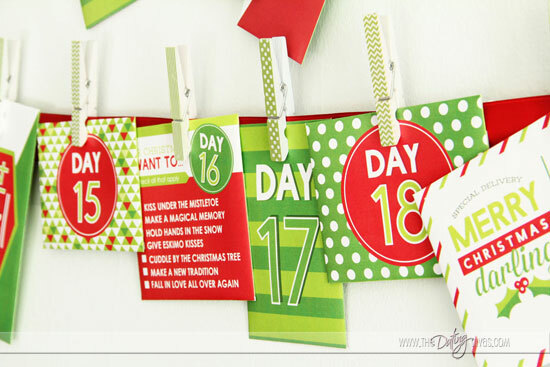 Our new Christmas Countdowns will help you accomplish just that– kick-start your Holiday season of memory making today! Can you tell me how many pages I’d have to print for the envelopes and cards? Is it 25 pages altogether? Hello there! For the Spouse Christmas Countdown, there are 42 pages to print to create the envelopes and cards. That is including all the pages of blank cards you can customize (there are 9 pages of those blank cards).